This is the method I have been working on. It is meant as a method to transfer the mechanical energy from any rotating pulley system to the ground via and endless loop of variable length. The length of the loop can be changed while in operation. I'll post an animation of the device in operation when time permits. As the main spool (gold elements) rotates, the conveyor belts, which are geared to the main shaft, travel about 1/2 inch (the line diameter) to keep the spooled line centered and cancel out the tendency for it to wind off the ends because of the spiral winding and unwinding. To pay out line (in blue), the winder/dewinder swing arm assembly (green elements) rotates counter clockwise (from pictured view). Reverse to take up line. Line in routed through a hollow shaft with outer roller support bearings and line will require swivel bearings at 20 foot intervals to avoid twisting when pay out and take in activation. Generator (in red) is linked by roller chain to main spool assembly. A spool diameter of 10 feet and a length of 20 feet should store over 12,000 feet of 1/2 inch line (actually not round, just points on the conveyor belts. Four belts are pictured but six or eight would be better). This should give the system the capability to reach several thousand feet of altitude. PS: This is not the same device I have been mentioning in the past. That one will be a patented tool available to measure and test all types of energy systems. DISCUSSION INVITED: Notes@EnergyKiteSystems.net Please copy URL for us when you send a note for this page. This design is intended to be operational while winding or unwinding and at any altitude. 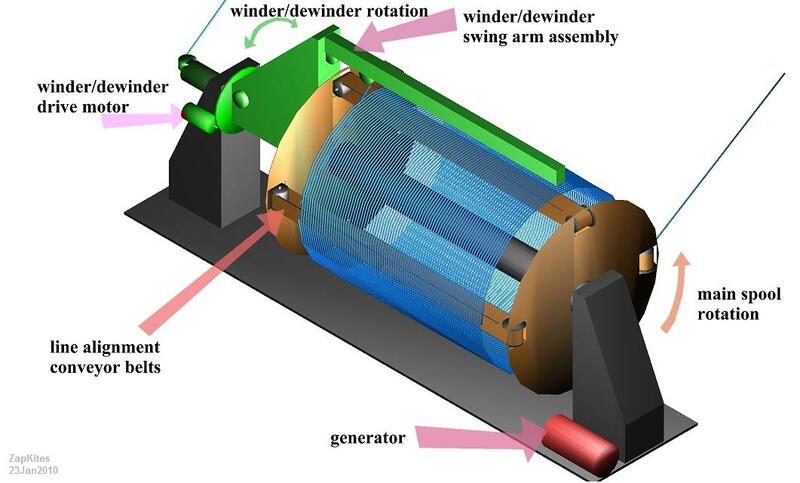 Depending on the speed of the wind driven rotation, the unwinding operation may require some braking of the main spool so that the swing arm can keep up; i.e., if both are rotating in the same direction at the same speed no line would actually be payed out. This design also makes it possible to operate at any altitude. Note that the blue "line" in the lower right hand side of the picture is the pulling element; and the take-up side (blue line at far left) is routed through a hollow shaft on the left side and through a series of pulleys out to the "swing arm assembly" and back to the "main spool". The "swing arm assembly" has a pulley mounted on a track that is servo or gear driven so that as the swing arm (green element) winds or unwinds it keeps the line properly placed so as to avoid overlapping or leaving gaps much as a fishing reel does. Another item with this design I forgot to mention is that the actual wind-harvesting element loop will need to be connected via pulley to this endless loop element which is probably a good thing to do anyway as winds at different altitudes acting on a system that runs the full length would be much harder to control. This device is meant only to transfer the mechanical energy to the ground. I will add some of the detail views soon to show how each part functions. This is how KiteLab's successful KiteMotor 1 variloop is manually handled & automation seems practical. There are many possible variations in handling variloops & Brooks approach is also workable. Ideas involving many always-engaged pulleys do stink, but Dan Parker's idea of using terrain suspension to hide long side-pulled sections is cool. A single pair of added split-pulleys suffices & any number of such pulleys can be completely disengaged for zero added friction during power generation. 1. loop not-working while let out or hauled in. Sorry to DaveS for me not explaining my reasoning more clearly. I see much advantage to having the loop to be variable length, as with any AWE system: the goal is to find the wind energy and harvest it. The best wind energy not always in the same place all the time. I have several different designs scratched out involving connectible segments, but for simplicity of automated unmanned operation (MY requirement for AWE to reach a significant level of operation) the winder arm was my best bet and easiest to CAD up.